Beautifully Drawn, Age-Appropriate Coloring Books. Sure to appeal to clients, young and old alike. Each book contains between 30 to 48 designs. Set of six 8-1/2" x 11" coloring books. 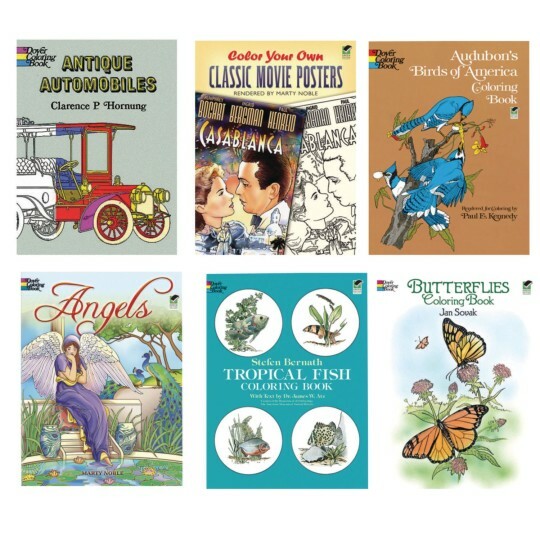 Includes 6 beautifully drawn, age-appropriate coloring books that are sure to appeal to clients, young and old alike. Each 8-1/2" x 11" book contains between 30 to 48 designs. Set includes Angels, Antique Automobiles, Classic Movie Posters, Birds of America, Tropical Fish and Butterflies. Great for use during our art activities at our elderly care center. The residents enjoy the variety.